Stow your treasured accessories in this rosewood box featuring a map detail of your choice. That sea glass he found in Key West looked right at home next to his custom map cufflinks. Keep your treasured items securely stowed while commemorating your favorite destination with this custom map box. Customized to the coordinates of your choosing, each map or chart swatch is displayed in resin and set in a pewter compass rose base. 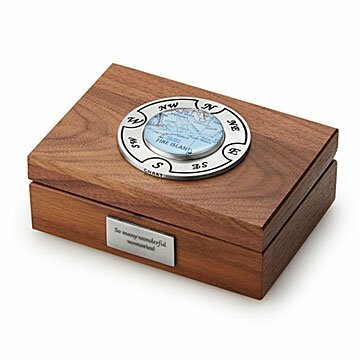 The solid rosewood box also features a front plate with a personalized engraving (up to 25 characters) whether it be your names, a special date, or a favorite mantra. It makes eye-catching storage for custom map jewelry and accessories or other small keepsakes. International locations are available, but maps may be less detailed. Handmade by Charlotte Guptill in Maine. Many congrats to the artists on a lovely piece! Purchased as a gift for my husband. Very happy with the purchase and would recommend to anyone looking for a quality keepsake box to contain something special. My Dad absolutely loved it. He is going to put special items from his life in it. This is a special birthday gift for my husband, a serious boater. The map in the compass rose is our marina. I have a vintage gold bo'sun's whistle to put in it to complete the gift.